A collection of pieces written since “the end of art”—not to be confused with the death of art. Borrowing his concept from Hegel, respected critic Danto observes that unlike the centuries of art made for spiritual needs, the art of our time has generally lost the power to communicate on its own and must be explained, because we have only an external relationship with it. Plato argued that pictures are the same as dreams, shadows, reflections or illusions, but now that contemporary artists use any or all materials, we often view the actual object as art. Paradoxically, now that it no longer offers the illusion or reflection of reality, art is no longer understood as an essential part of life and has to be interpreted in a museum. What is the difference, asks Danto (Philosophy/Columbia Univ. ; Madonna of the Future, 2000, etc. ), between Warhol’s Brillo Box and a cardboard case of Brillo Pads? 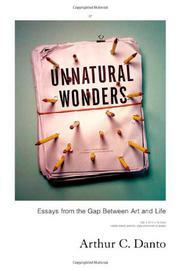 He illustrates these introductory thoughts with more than two dozen columns from the Nation (required reading for those who pay attention to contemporary art since it began publishing Danto in 1984), ranging from the 2000 Whitney Biennial through the artistic reaction to September 11 and the nation’s culture wars while dealing with major artists and exhibitions of the recent past. Danto sympathetically assesses Damien Hirst (sliced-up sharks suspended in formaldehyde) and eloquently explains why some initially impenetrable art might have compelling statements to make, but he doesn’t spare artists he feels are not pulling their weight, lamenting the hot Paul McCarthy’s juvenile art of “disgust” and tackling the very uneven quality of the talented (and even hotter) Matthew Barney’s Cremaster Cycle. Also included are a handful of essays written for exhibition catalogues, transcripts of lectures, and reviews of important exhibitions of such pre-end artists as Leonardo, Gentileschi, and Chardin. Among the most sensible, intelligent, logical, and accessible art criticism of the last five years.